A WHO’S WHO of the music glitterati gathered in New York last night to help the first couple of music, Jay Z and Beyonce, launch the rapper and music mogul’s new music service Tidal. The streaming platform is set to go head to head with established players like Spotify and Pandora Radio in an increasingly heated market, although having so many gazillionaire megastars behind it at launch will do no harm. Also, Jay Z and Beyonce succeed at everything they do, so their confidence in their product is fairly understandable. The service is co-owned by Kanye West, Daft Punk, Alicia Keys, and Madonna among others, all of whom were in attendance. Not content with launching the service, the musicians also signed a declaration heralding ‘a whole new era’. Other stars who were in attendance at the event included Chris Martin and Rihanna. Tidal is billing itself as the first service of its kind that’s owned by the artists. Other streaming services, particularly Spotify, have come in for intense criticism for the rather small royalties they pay the artists whose music they’re streaming. Last year Taylor Swift for example pulled her entire catalogue from Spotify in a row over royalties. Swift’s music will be available on Tidal, although her most recent release 1989 is nowhere to be found. How Tidal will address artist compensation is not yet known, although partner Alicia Keys did say at the event that owners ‘believe it’s in everyone’s interest to preserve music’. It’s twice as expensive as its rivals at €19.99 per month which will make it interesting seeing how it does. Its chief selling point, other than the celebs endorsing it, is the ‘lossless’ nature of its streams – i.e. all streams are in high fidelity; music streamed off Spotify for example is processed at a far lower level of audio quality - albeit a lower level of sound quality option is available for €9.99. As to how Tidal works in practice, its interface appears to be very similar to that of Spotify. It’s search engine needs a little work though – Jay Z can only be found on it by putting a hyphen in his name (the rapper officially removed the hyphen in 2013). Tidal is available in 31 countries at present, with another six to be added by June this year. 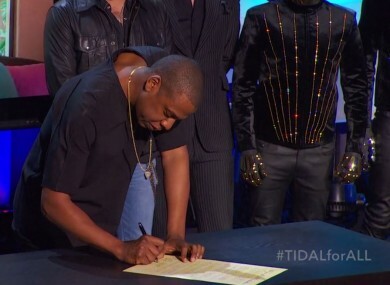 Jay Z’s move into streaming was long expected. Earlier this month his company Project Panther Bidco acquired more than 90% of Swedish streaming service Aspiro AB for €50 million. In the run up to the launch the stars involved had been turning their social media profile pictures blue in solidarity for the project. Read: Why are artists like Kanye West and Rihanna turning their profile pictures blue? Email “Can Jay Z's Tidal streaming service really challenge Spotify?”. Feedback on “Can Jay Z's Tidal streaming service really challenge Spotify?”.